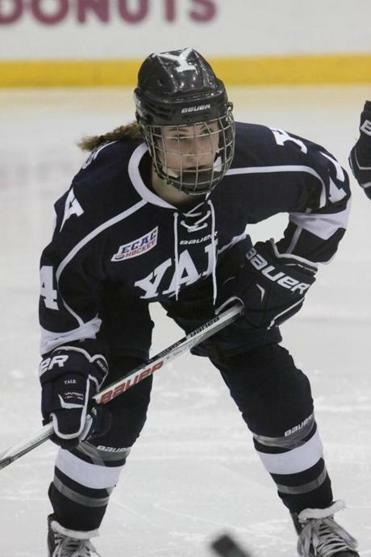 Acton’s Mallory Souliotis was pacing the Yale women’s hockey team in points (23) through 25 games. Mallory Souliotis was honored as the most improved player on the Yale women’s hockey team at the conclusion of her freshman season. 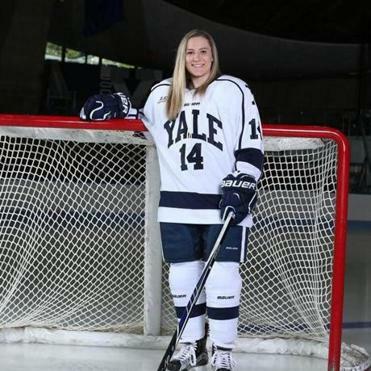 Mallory Souliotis is a sophomore defenseman at Yale. nd points (23) while providing a calming influence on the ice. “Mallory has the ability to control the game at times. She doesn’t panic under pressure and she’s made us a more dynamic team,’’ said Yale coach Joakim Flygh. The 19-year-old biomedical engineering major was an All-Independent School League hockey and softball selection at Nobles. She also played on two national championship (U-12 and U-19) teams with the Assabet Valley girls’ program. For the past three summers, Souliotis served as a counselor at Greg Carter’s European Hockey School sites in Concord, Easton and Hyannis. Her brother, Michael, graduated RPI last year, where he was captain of the golf team. Q. You scored your first goal as a collegian last season at RPI, with your brother and other family members in the stands. Describe that experience? A. It was a great feeling. My aunt and uncle live near the RPI campus and my mom came too. I had breakfast with my mom and brother before the game and showed my family the goal puck afterwards. Q. Can you explain how you’ve nearly tripled your point total from last season? A. Hard work last summer at Greg’s hockey camp, skating twice a week with former teammates from Assabet and getting stronger and faster at the gym. I have a lot more confidence this year and when I get the puck I’m trying to create offense. Q. When did you start playing on defense exclusively? How was the transition? A. My sophomore year at Nobles. Defense is very different, but I definitely liked the different perspective and felt I had more confident when making plays. Q. You were a seven-day per week hockey player at Nobles and with Assabet Valley for four years. How did you manage keep up with your school work? A. I would study in the car and on the bus going to and from games. To my parents and myself, grades always came first. I sometimes studied late into the night for exams, so staying up late to study here at Yale seems routine. Q. At Nobles you were co-president of the Romanian Children’s Relief club, raising money to help children in that country. What motivated that effort? A. I have always liked working with children and we were required to do 80 hours of community service before graduation. I was in a group of 10 students and two adults who traveled to Romania in 2012. We worked with orphaned and abandoned children, some who were disabled, and painted a mural in a local hospital. It was a very gratifying experience. Q. Your favorite class at Yale? A. Physiological Systems. In particular, the way the central nervous system regulates all the other systems of the body fascinated me. I’ve studied harder for this course than any other. Q. What is your team’s favorite destination after a game? A. Mory’s in New Haven where we meet with friends, family and alumni. It’s great fun. Going there gave me a great sense of Yale history and tradition. I carved my initials into one of the tables the first time I went. Q. Your family certainly has a love for dogs. A. I volunteered at Save A Dog shelter in Sudbury after my freshman year of high school and continued until going away to college. My family still takes in foster dogs before they are adopted. We have two dogs at home, a Flat-Coated Retriever that we rescued and a Golden Retriever. Q. To whom do you attribute your success as student and athlete? A. My parents, Mark and Eileen, who sacrificed so much for me to follow my dream of playing college hockey and receiving a world class education. Everything from the 6 a.m. wake-ups for hockey practice to weekly drives they make to the Yale rink. Q. What do you remember most fondly of your time playing for Assabet Valley? A. My teammates, because no matter what the score or outcome we were always there for one another. Six of my teammates at Yale came out of the Assabet program. Q. What did the Most Improved Player award mean to you? A. It was great to know my hard work was appreciated and it has motivated me this season.